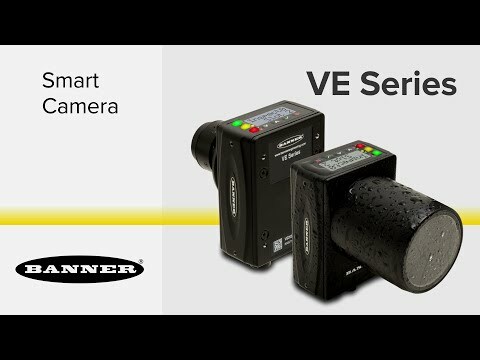 MINNEAPOLIS, MN, October 25, 2017 – Banner Engineering, a leading provider of technology for industrial automation, today announced the release of a 5MP VE Series Smart Camera for detection of fine details on large or complex targets. The latest addition to the VE Series has the same ease-of-use, compact and robust housing, and intuitive on-board display as other VE Series Smart Cameras, but provides finer levels of detection and a wider field of view. Featuring a 5MP (2592 x 2048) CMOS imager, this versatile smart camera can reliably detect very small objects as well as fine details and minute flaws on complex targets. The high levels of accuracy and precision offered by the 5MP VE Smart Camera make it an easy-to-use and cost-effective alternative to more complicated vision systems. The wide field of view provided by the 5MP VE Smart Camera makes it possible for a single camera to perform a detailed inspection over a large target area in a single image capture. The ability to cover more area in one inspection can reduce or even eliminate the need for additional inspections as well as the equipment needed to perform those inspections. VE Smart Cameras are also available in 2MP (1600 x 1200 pixels), 1.3MP (1280 x 1024 pixels), and WVGA (752 x 480 pixels) models. Also available is the latest version of Vision Manager, Banner’s easy-to-use software for VE Series Smart Cameras. Vision Manager provides a number of tools and capabilities that enable VE Smart Cameras to solve a wide range of vision applications. The software includes runtime editing capability that reduces costly downtime, and the software emulator allows for offline building and troubleshooting of applications. The new version of Vision Manager (version 1.4.0) allows for the creation of multiple password protected user profiles. This empowers users to update inspections to facilitate a smooth workflow while restricting the changes possible to those included in an individual user’s profile.